Cranberry trees (Viburnum opulus L. var. americanum Ait. ), also known as highbush cranberry or American cranberry, produce sour fruits similar to those found in commercially produced cranberry sauces used at Thanksgiving and Christmas meals. The fruits from the highbush cranberry provide an excellent source of vitamin C. While the bush thrives in the wild, gardeners enjoy growing highbush cranberry in the yard or garden for its decorative appeal as well as the fruits that ripen in the fall. A member of the honeysuckle family, highbush cranberries primarily grow in bogs in North America. Similar to the commercial fruit crop, highbush cranberries grow up to 15 feet in height, forming a rounded shape that makes a great hedge in the landscape. The bush produces small white flowers in May through July, followed by berries that turn bright red when mature in the fall. In the wild, the plants grow along streams, in wet forests and on hillsides where they gets lots of moisture. Gardeners in hardiness zones 2 to 7 can grow highbush cranberries in the landscape or garden a long as the plants experience little moisture stress. The bushes grow best as transplants from containers obtained from the nursery. Look for a sunny to partially shady area with well-drained soil. The plants produce more berries if planted in full sun. Dig a hole two to three times the size of the root ball, and plant the bush at the same depth as found in the container. The bush requires regular watering until it is established. Highbush cranberry plants benefit from an application of compost each spring. Some gardeners prune the plants immediately after flowering to improve the shape of the plant and encourage new shoots. Once the fruits turn red in late August or September, it’s best to pick them before they fully ripen. If the fruits stay on the bush until after a heavy frost, the berries feel softer but also develop an unpleasant, musty odor during cooking. Cranberries work well in sauces, jams and jellies. Bakers use the berries in a variety of baked goods including breads, tarts and pies. The berries taste delicious when dried with sugar, then eaten or added to cookies and other baked items. Cranberries are also used in juices. Cranberries freeze well, allowing cooks to keep a few packages in the freezer for use after they berries go out of season, usually after the end of the year. 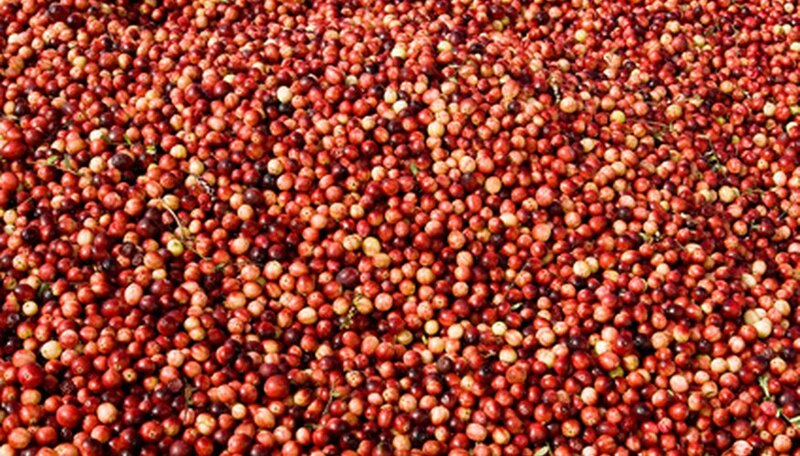 Native Americans used cranberries to treat bladder and kidney diseases. Early settlers used the berry, both cooked and raw, to help with ailments including scurvy and appetite loss. According to the University of Maryland Medical Center, studies show cranberry fruit helps prevent urinary tract infections. Antioxidants found in the fruit may help protect people from heart disease by helping to lower the bad cholesterol and preventing plaque from building up.